Knitting isn’t just about sweaters or mittens these days, and artist Jessie Hemmons knows that first hand. She is a yarnbomber—a guerilla knitting street artist—who uses yarn to create exhibits in public environments, such as a tree, statue, or even a VW bus. Check out the full article at the link above, and also check out the link to Jessie’s website, Ishknits. Her blog includes interviews with other yarn-bombers. This is part of an art installation in Miami by the art group SCOPE. The artist is a New York artist named Olek. I think this piece was part of a 2010 art show called, “Knitting is for Puss***,” though I can’t find a lot of detail about it. In yarn bomb pieces, it I’ve noticed that the same style of yarn is frequently used – this pink-camo yarn that seems like it would be completely awful for garment knitting. Coincidence? 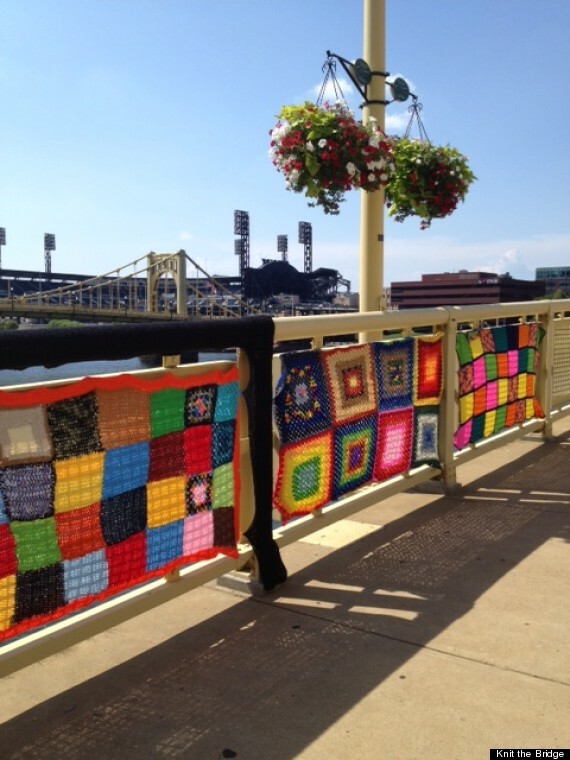 In August, the Andy Warhol Bridge in Pittburgh was Yarn Bombed by the Knit the Bridge group, a team of more than 250 volunteers that crowd-funded $100,000 to raise money to complete the project. 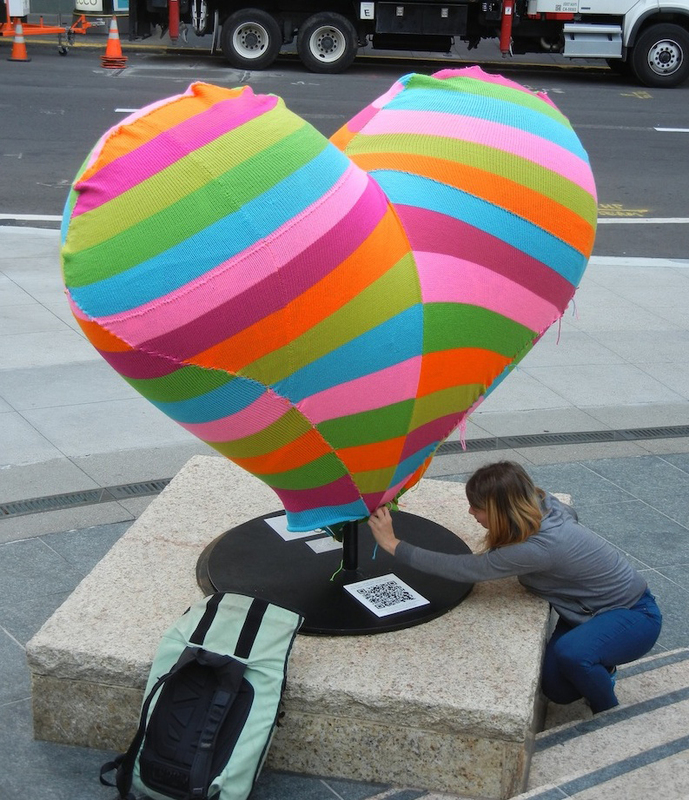 The installation was billed as the largest knitting installation in the US. Catch the full article from the Huffington Post website and view the video. If you can wait through the commercials, there is also a cool 60-second bit about a marathon runner that knit while he runs. 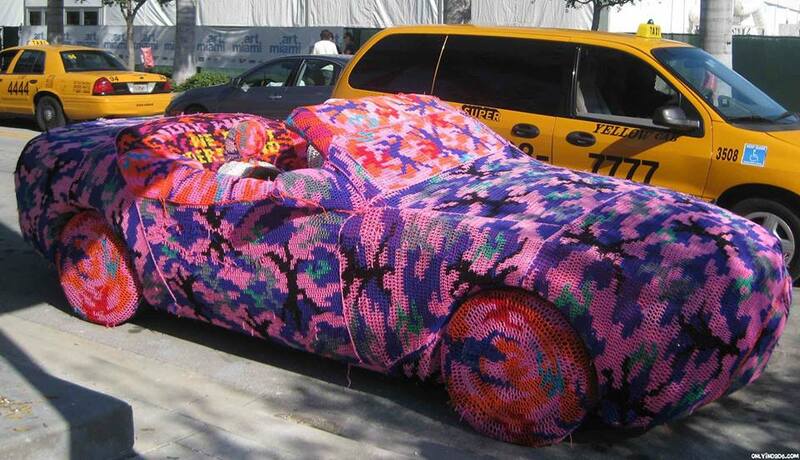 Talk about extreme knitting! 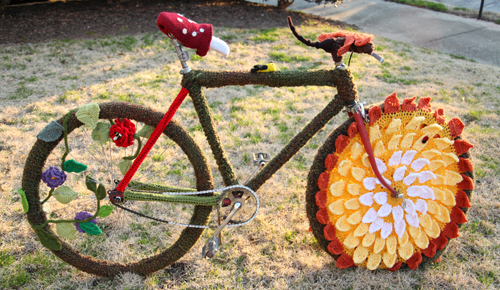 Yarn bombing is such a whimsical expression of the art. Check out the full post and enjoy a few minutes escape from the world.